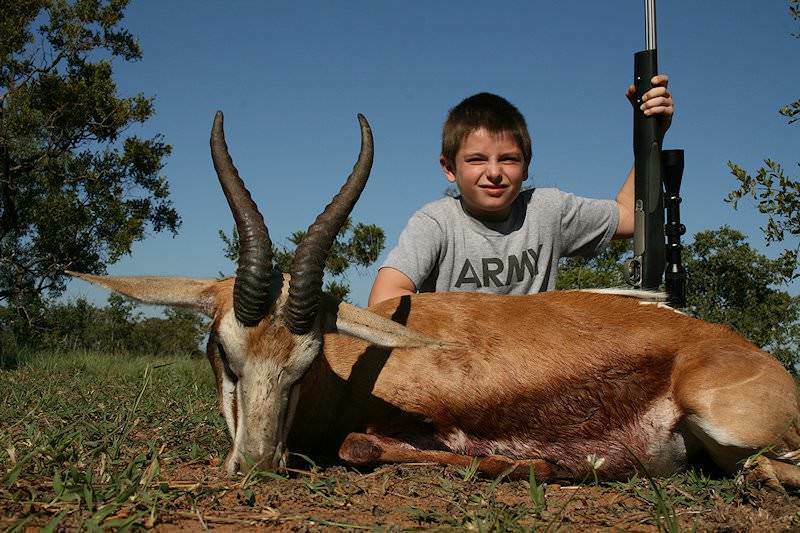 South Africa's national animal can be hunted on safari in the central and western parts of the country. 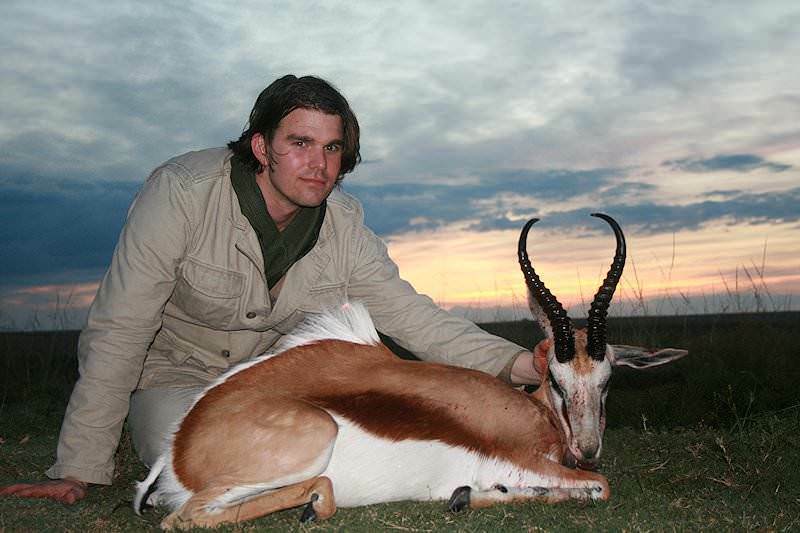 The springbok is probably the only true gazelle found in the sub-region of Southern Africa. 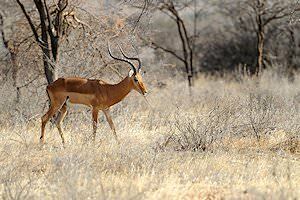 Some maintain that the impala is also a gazelle, but most put him in a clan all by himself. 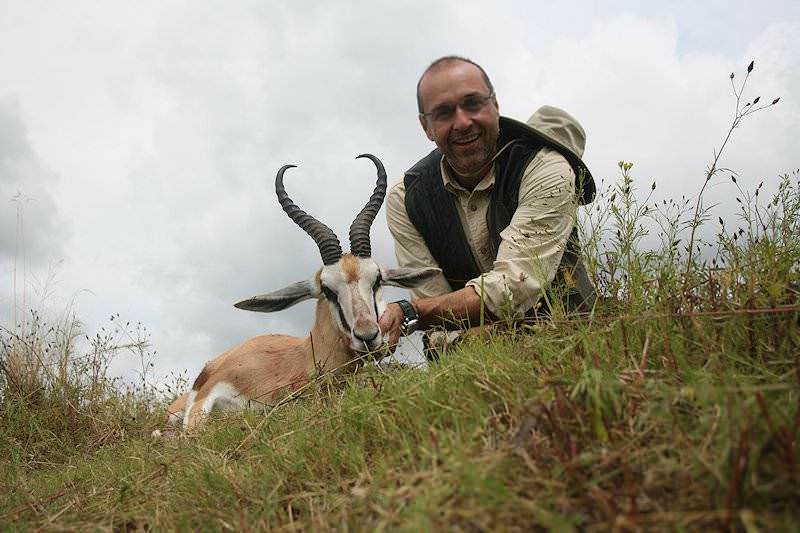 These beautiful little antelope inhabit the more western reaches of Southern Africa. Once their numbers were in the millions, however, today they are confined mostly to the game reserves and game ranches. 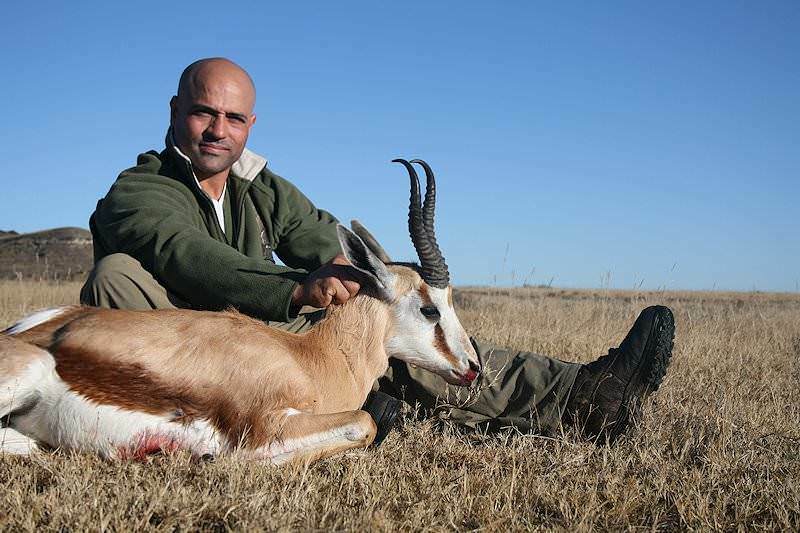 Both the males and females of this unmistakable little gazelle carry horns, the ewe's horns being somewhat shorter and more slender. The national animal of South Africa, his name means “jump buck”, an accurate description of his pogo-stick style of jumping when alarmed. 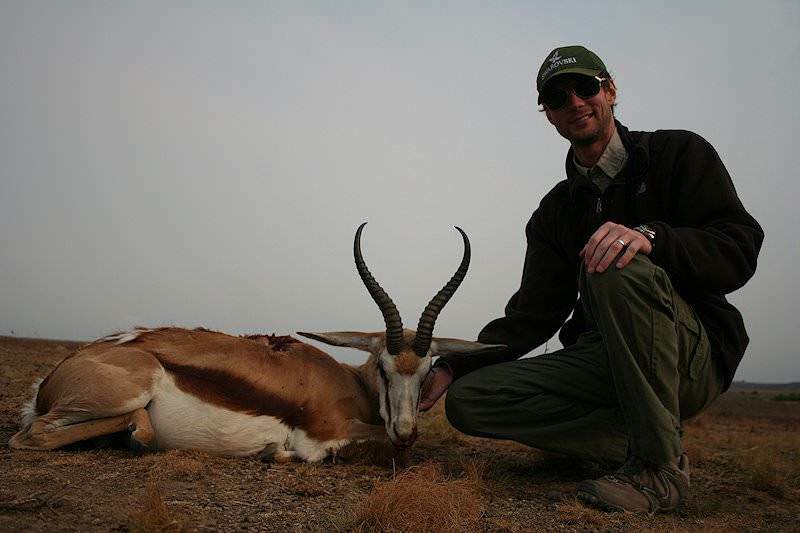 This social herd animal is at home on dry, semi-desert, open grasslands, including the Kalahari. 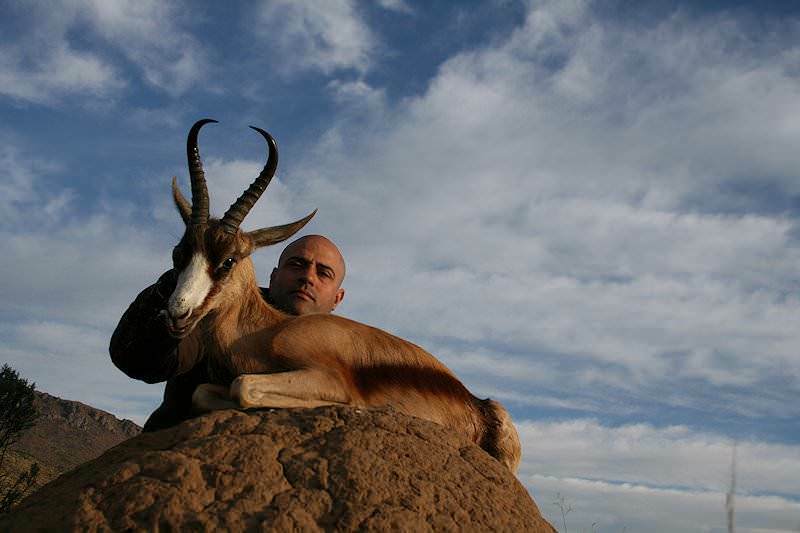 He is both a grazer and a browser and not dependent on water, although he will drink daily if water is available. 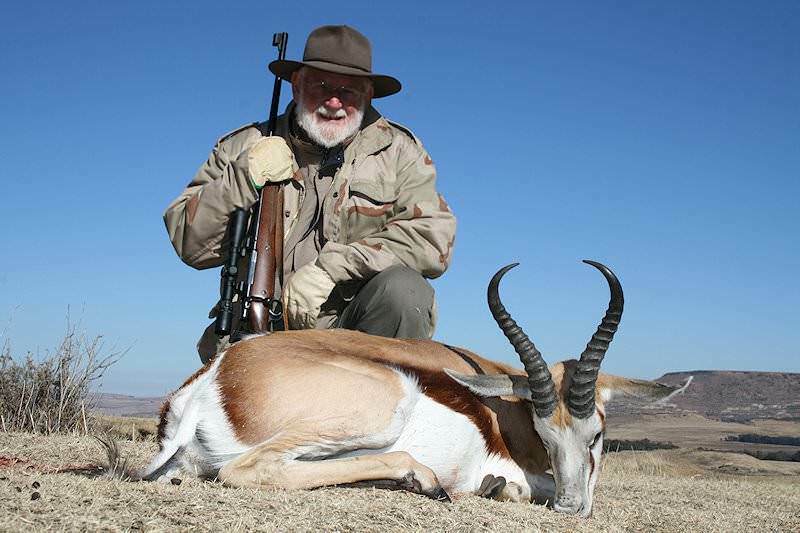 When hunting springbok, trophy evaluation can be very difficult; as mentioned, both rams and ewes carry horns, and herds can be very large and thus hard to approach with all those eyes and ears trained on the hunter. 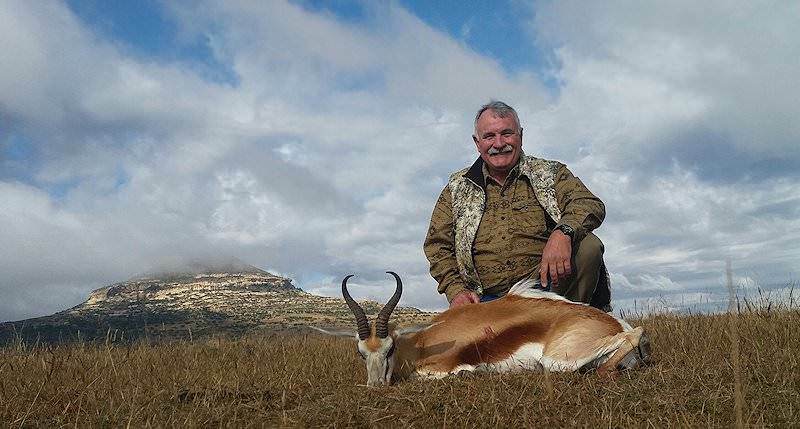 Because of his phenomenal eyesight and his natural paranoia with regard to being approached, if you try to walk and stalk this little antelope, be prepared to do some crawling while hunting springbok. Try setting up ambushes on the approaches to feeding areas and pans, or even physical barriers such as fences. 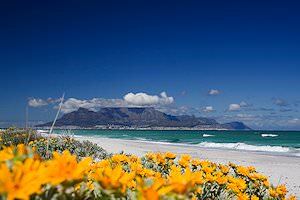 If you can approach within 300 yards, you are doing well and best take your shot. The flat-shooters will be the ticket when hunting springbok. Look to calibers that will propel a 120-grain expanding bullet in excess of 2600 fps. 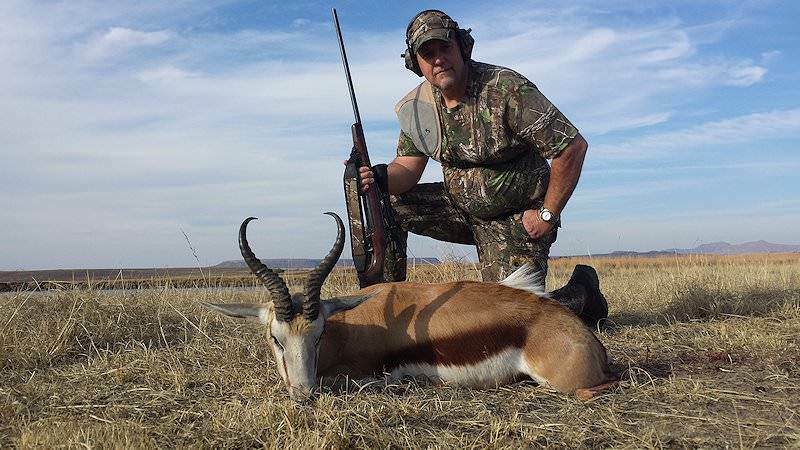 The 257 Roberts, 25-06 and the various 6.5mm's are all good choices for consideration when hunting springbok. If you really want to reach out there, look to the 264 Win Mag or the .270. 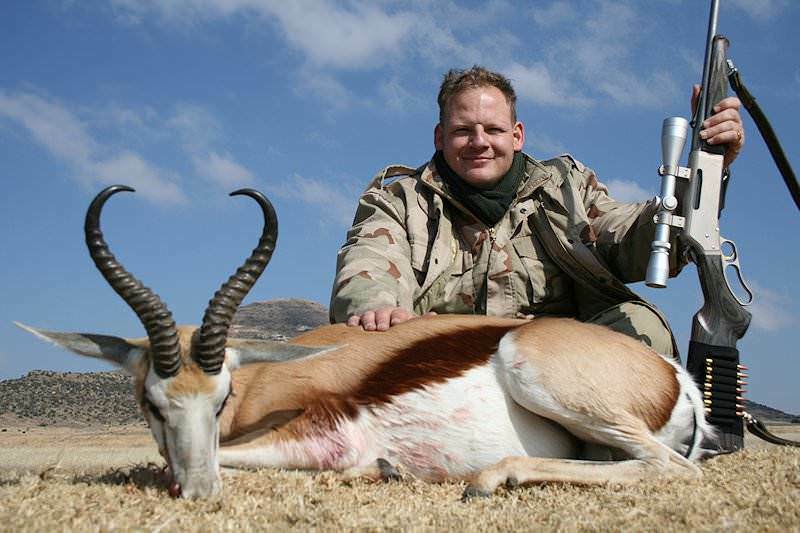 When hunting springbok, a good quality 6X scope will be indispensable for the ranges that you might encounter. 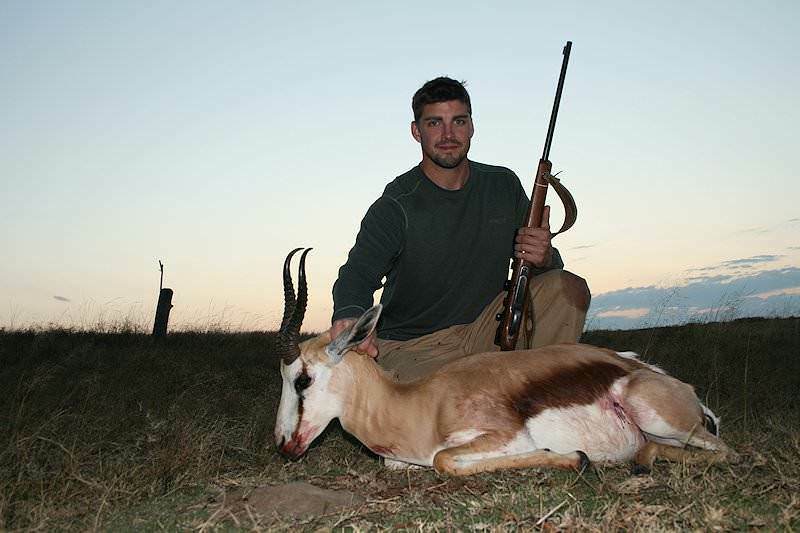 The springbok is legendary as the tastiest of all African game. 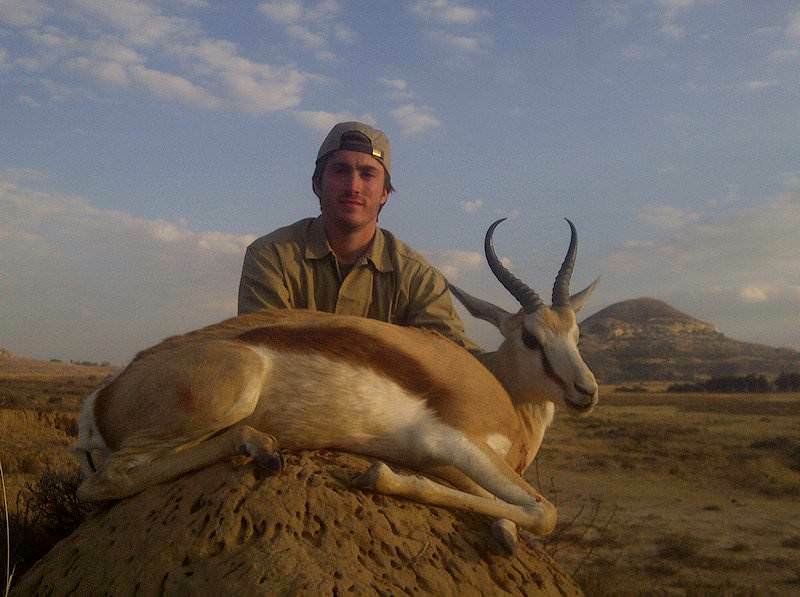 For the meat hunter, the side-on lung shot should be the choice; aim just behind the shoulder. 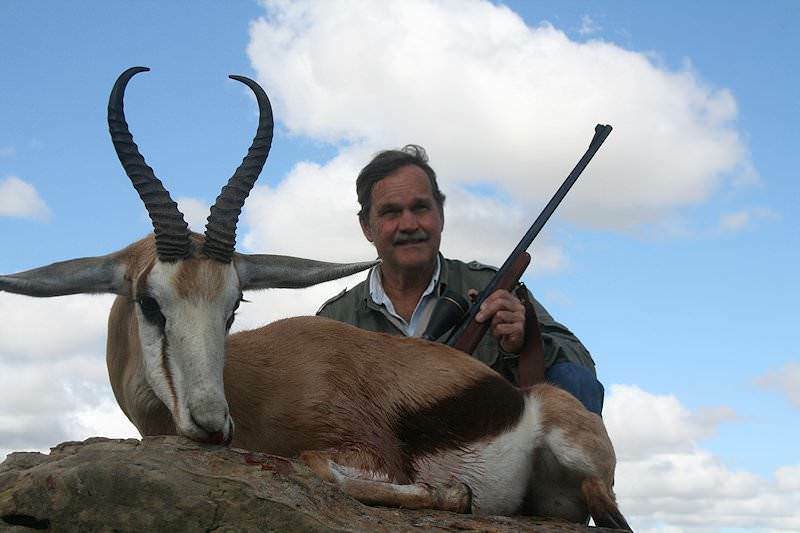 Hunting springbok for trophy calls for the high heart/lung shot right up the front leg, one third to one half into the body and squeeze. 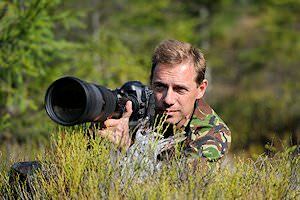 Headshots are best left to the professional “cullers”. 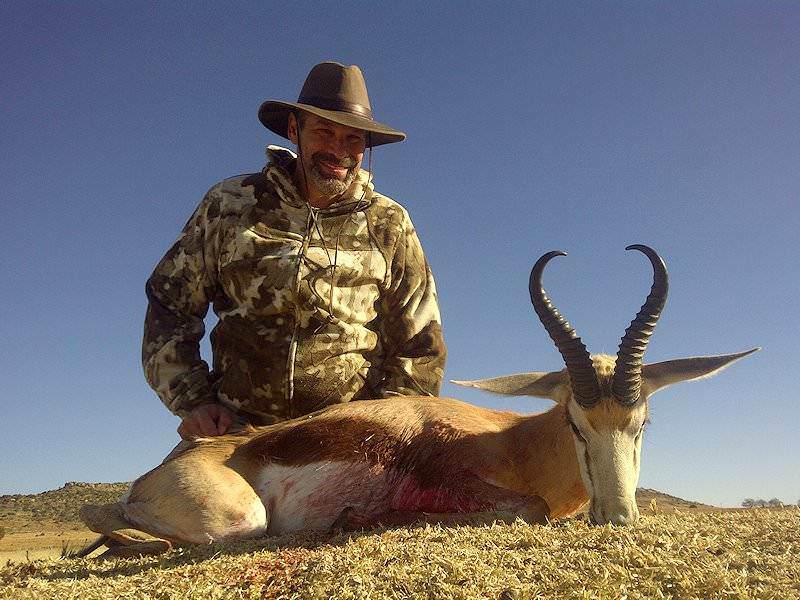 Hunting springbok will always be a challenge due to his size and excellent senses; stalk carefully, keep the wind in your favor, get as close as you can, bring the right equipment and then shoot straight. 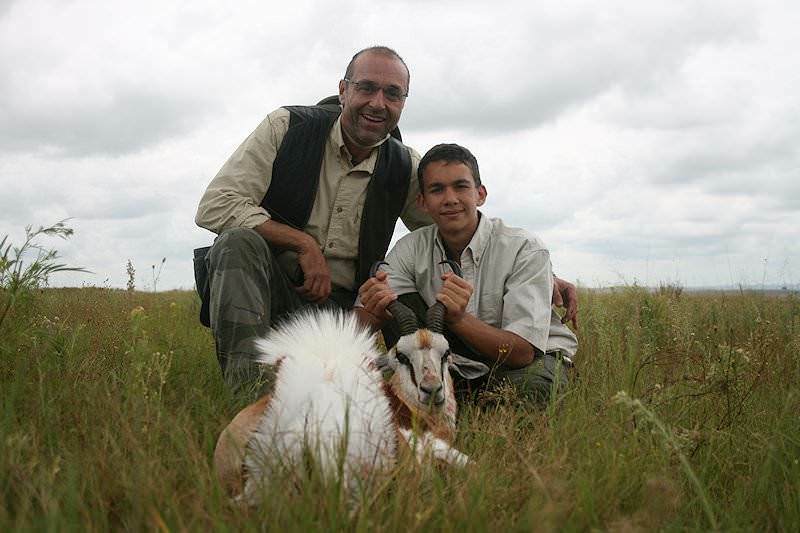 This package is ideal for hunters with limited time and/or experience looking to take home something unique. 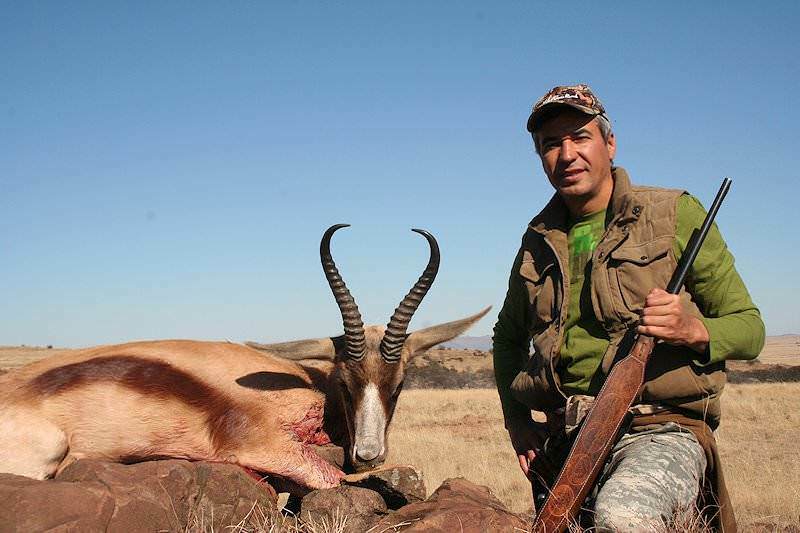 You'll pursue black wildebeest, white blesbok and springbok in the eastern Free State hunting region, known for its vast open plains. 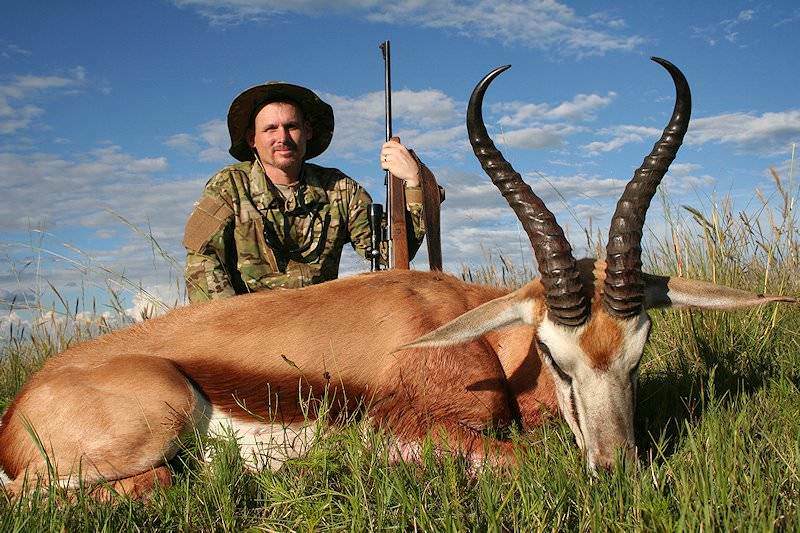 Hunt in South Africa's two most popular hunting areas - the bushveld and Free State - over two weeks of hot pursuits. 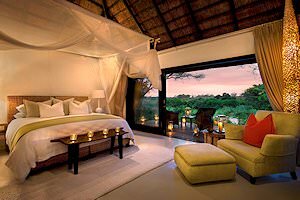 The flighty plains game species included are the kudu, impala, blue wildebeest, zebra, black wildebeest, springbok and blesbok. 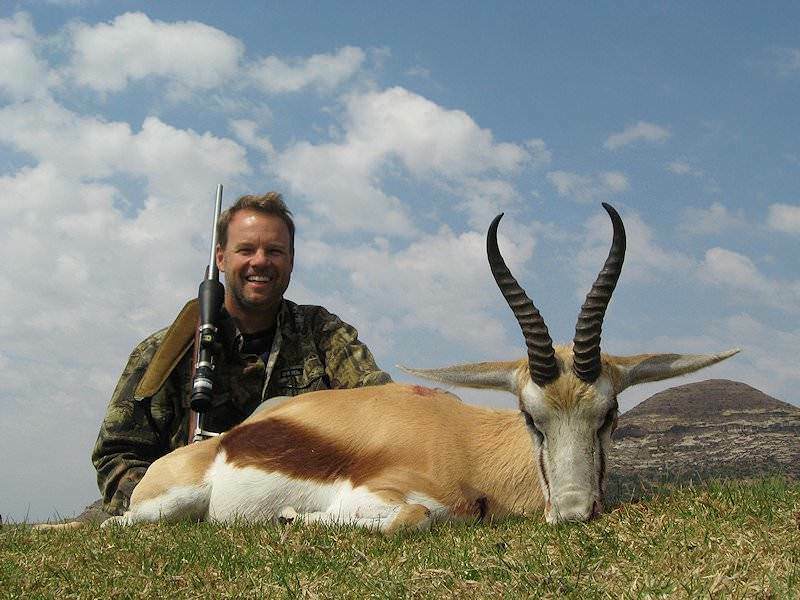 Pursue twelve incredible plains game species over a three-week adventure in South Africa. 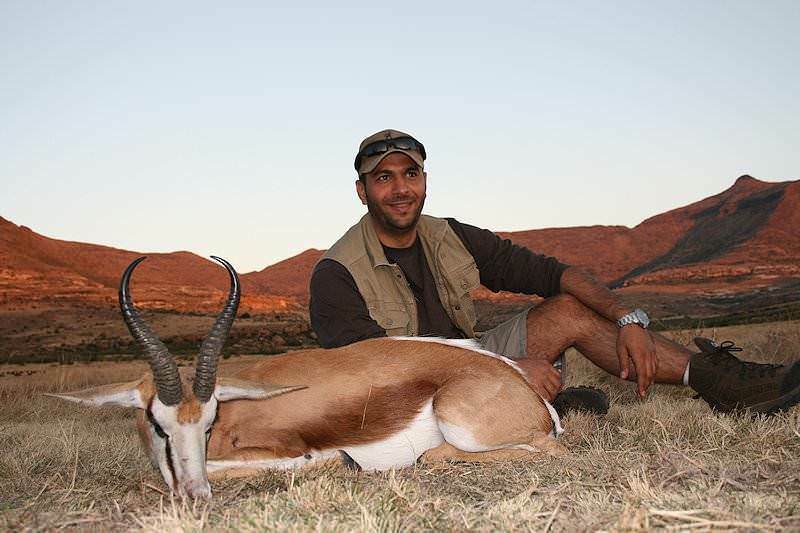 Hunt for the likes of springbok, kudu, zebra, gemsbok, mountain reedbuck and more in the bushveld, Free State and Eastern Cape hunting areas.